"Pope Francis brings a new energy many young people can identify with"
Donal, Jack, Niall and Mairead recount their experiences working as volunteers at the recent World Meeting of Families in Ireland. Students and young professionals attending Opus Dei centres in Ireland played an important role during the World Meeting of Families in Dublin last week: they were among the thousands of volunteers who helped out and performed at the event. When asked why he had decided to volunteer, Donal explained that he had been a bit hesitant at first, but when he heard that this would give him an opportunity to perform for the Pope at the Festival of Families in Croke Park on Saturday, he immediately made up his mind and signed up for the whole week. Donal was one of the more than 200 volunteers who carried flags around the pitch at the start of the event, and also had to perform one of the several choreographed dances on the night. There was nothing straightforward about carrying these flags into the stadium. It involved a very elaborate drill for which they had to commit to rehearsing on a number of occasions during the preceding weeks—and for several of them this entailed travelling long distances from various parts of Ireland. 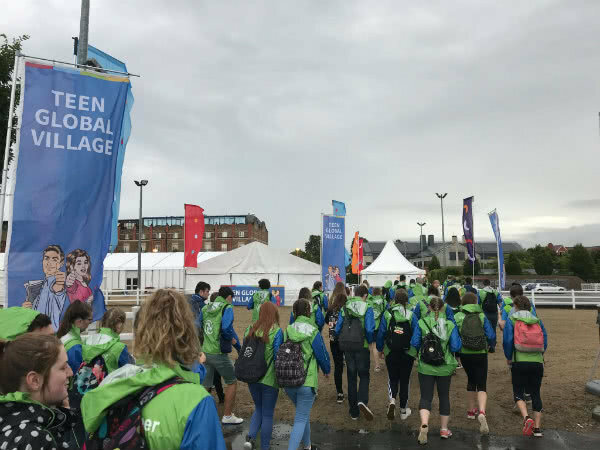 As the week unfolded, and the volunteers started to take their positions of responsibility at the Congress in the RDS venue, everyone could sense the upbeat and joyful atmosphere among the thousands of families that were flocking into Dublin from every corner of the world. Keen to ensure this would be an unforgettable experience for everyone, the volunteers spared no efforts in carrying out their duties with great diligence—always with a smile. Among a number of tasks, they were directly involved in taking care of families with children and young people, at the Children’s Global Village, the YouCat tent, and the Teens Space. They also performed other ad hoc duties, such as carrying heavy loads, stacking hundreds of chairs, checking pilgrims’ passes at access points, and looking after security on the grounds of the compound. Ben, a student from the Democratic Republic of Congo staying at Ely Study Centre, was very grateful for the opportunity to volunteer. It helped him to come out of himself, he said, as well as to grow in confidence and take on new challenges with personal initiative. The spirit of service he found among all the volunteers seemed to have a magnetic effect on him. The highlight of the week for this group of volunteers was getting very close to the Pope during the Festival of Families in Croke Park stadium and at the Final Mass in the Phoenix Park. Listening to the Pope talk about forgiveness in the family, Jack remarked that it was going to have a positive effect on his relationship with his many siblings, helping him overcome the natural differences and disagreements typical in any family. The Festival of Families was choreographed as a celebration of family life. It included testimonies from five families from Ireland, Canada, India, Iraq and Africa. The themes of the family testimonies focused on: forgiveness in the family; strength in the family; hope in family life; the inter-generational nature of families today; and the impact of technology on family life. In his address the Pope responded to the questions raised by the families. 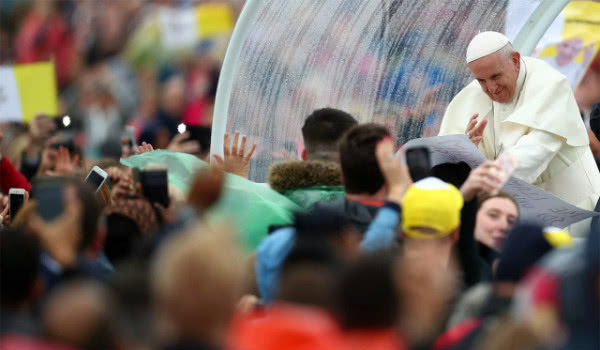 Sunday 25th was the day of the final Mass with Pope Francis in the Phoenix Park in Dublin. The altar was erected on the same spot where Pope St. John Paul II said Mass nearly 40 years ago on the only other visit of a Pope to Ireland. In a very poignant moment at a penitential service, the Pope asked for forgiveness for all the wrongs ever committed by priests, clergy and religious. In his homily he encouraged families to be witnesses to the Christian life and draw others to Christ. For Lauren, from Co. Kildare, being able to attend to pilgrims en route to and from the Mass was an extremely rewarding experience. She was so impressed by the endurance, patience and joy of the thousands who walked by her after hours of walking.